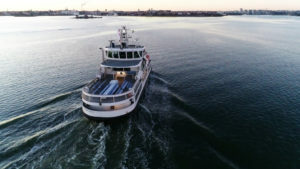 ABB and Helsinki City Transport trialled the remote operation of passenger ferry Suomenlinna II through a test area near Helsinki harbour, demonstrating the possibility of human oversight of vessels from anywhere. ABB’s positioning system, ABB Ability Marine Pilot Control, was retrofitted on the Suomenlinna II and steered from a control centre in Helsinki. “Autonomous does not mean unmanned. As vessels become more electric, digital and connected than ever before, ABB is able to equip seafarers with existing solutions that augment their skillsets. In this way, we are enhancing the overall safety of marine operations,” said ABB marine & ports unit managing director Juha Koskela.